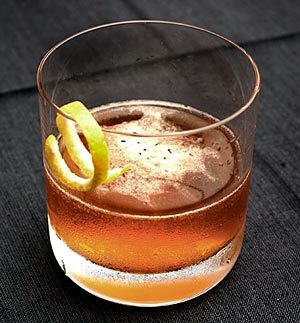 If you Google “improved cocktail,” you will find a number of somewhat differing drinks featuring the most venerable of the base spirits (i.e., whiskey, brandy and gin) or genever, aka “Holland gin.” That’s because, as Michael Dietsch puts it, improved cocktails are more of a template and less of a recipe. Still, I’ve just found that the “improved” model is a pretty amazing template with which to build a recipe. 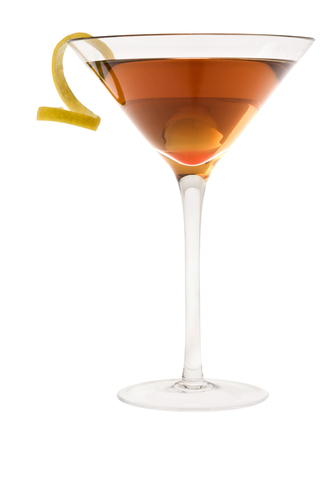 If, however, you walked into ur-bartender Jerry Thomas’s bar circa 1876 and asked for a cocktail, you’d find yourself with what we now call an Old Fashioned, a base spirit with sugar or syrup, bitters, maybe a bit of water and a garnish. That was a cocktail. Drinks that didn’t contain bitters were not yet considered cocktails — they were just mixed drinks, and some cocktailians still prefer that terminology. Specifically, if you had ordered last week’s drink at Mr. Thomas’s bar, you would have likely asked for a Holland Gin Cocktail, the once popular term for the spirit thatevolved into the dry English-style gins we all know. 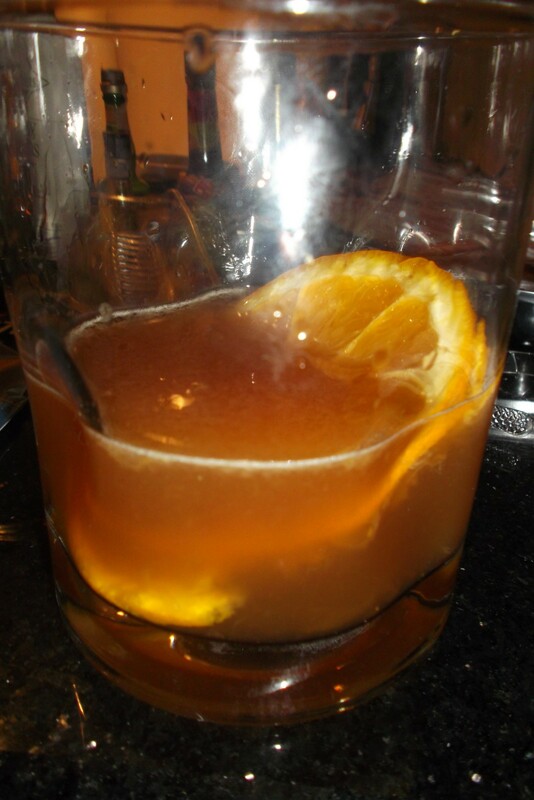 When you started adding other forms of booze to it, you were getting a bit fancy. Hence, the Improved Cocktail. For the last four years or so I’ve had the privilege of attending the annual TCM Classic Film Festival. It’s been great and I’ve been able to cover it from a few different angles, both as a classic film loving cinephile and, last year especially, as a cinema-addled boozer. This year, however, I’ve come up with a slightly different approach and will be covering the festival right from DOTW. For the next few weeks, rather than simply stealing drinks from elsewhere and trying them out myself as per usual, I’m going to be whipping up my own creations, all inspired by some of the amazing films I was lucky enough to see projected on the big screen in my native Hollywood. I’m not promising they’re all going to be cocktail classics. I’m not even necessarily promising they’ll be any good. I’m definitely not promising that they’ll be terribly original or unique. I am, however, reasonably certain that it’s a great excuse for me talk a little bit about a few remarkable movies. I’m happy to say, the first drink of our series surprised me by turning out to be very drinkable indeed. In fact, I think I’ll have an easier time persuading many of you to try the drink that than to watch the film. That’s because, our selection is a tragicomic masterpiece about an elderly couple who are forced to separate by the behavior of their selfish, but all too understandable, adult children. I know nothing I’m going to say that will persuade you that watching Leo McCarey’s sneaky, awe-inspiring 15 hankie tragicomedy, “Make Way for Tomorrow,” goes down nearly as easily as this rather lively variation on the oldest of popular classic cocktails, but it’s that good a movie. The drink isn’t too terrible either. Muddle the sugar cube and citrus slice with the soda water in the bottom of a cocktail shaker. 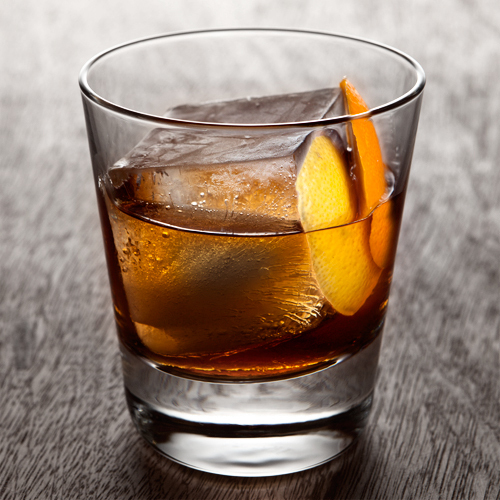 Add the Rittenhouse Rye and Amaro CioCiaro – one of a number of bittersweet Italian after-dinner liqueurs – and plenty of ice. Shake vigorously and strain into the smallest Tom Collins or Old Fashioned glass you can find. (The one in the picture is too big, but it did okay for me.) Toast your mom and your dad. In fact, if they’re alive, give them a call – before you have a second drink. Unless you’re a member of the Cinephile American community, you’ve probably never heard of Leo McCarey’s 1937 masterpiece. Though “Make Way for Tomorrow” has nearly as many well-earned laughs as tears – McCarey is legendary as a director of comedies like “The Awful Truth” and “Duck Soup” – it was a failure at the box-office. It could hardly have been a surpise. With subject matter like this, it would be a tough enough sell on today’s arthouse circuit. Aside from being the height of bittersweet comedic drama, the scene is interesting for cocktail geeks. The Old Fashioneds the couple enjoys actually look nothing like Old Fashioneds you’d get today. They are served in the kind of teeny-tiny glass that was once standard for cocktails – in this case a sort of mini-Tom Collins – and it’s not on the rocks. It’s presumably served up and with a long, spiral orange peel like you’d get in a classic Horse’s Neck. Even so, I started out making this drink in the usual Old Fashioned fashion by building it in the glass and serving it on the rocks, but the results just didn’t come together. The amaro, which I’m using largely, though not entirely, in the place of the bitters, just kind of held the drink down. Shaking it and serving it in a chilled glass, however, added the kind of lightness to the drink that brought the whole thing together. It’s a bit glib to compare shaking a cocktail to the ample humor in an essentially tragic film, but it really did kind of feel and taste that way. 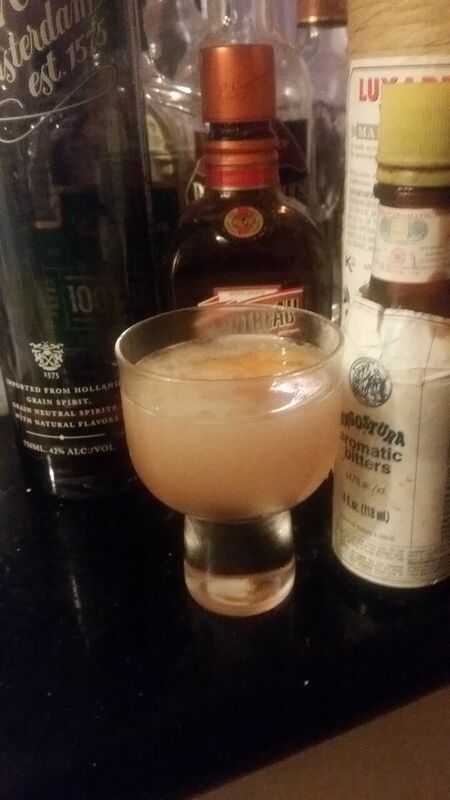 Finally, though I usually try to make my drinks as non brand-specific as I can, it’s hard enough to come up with a new cocktail in three days if you’re not an absolute souse and have a day job. I will say that I leaned towards the oldest school brands I could. I went with rye instead of bourbon, and the wondrous Rittenhouse Bottled in Bond over a fancier newer brand because it’s just possible that that’s what Beulah Bondi and Victor Moore might have been served way back in 1937. Like the movie, you might be surprised but it packs at least as much of a punch today as it must have 77 years back. Don’t believe me? See for yourself and watch the whole movie right here. I guess modern ways aren’t entirely for the birds.